Samuel and Sylvia Sion brought in to last night’s member meeting an amazing impromptu class on fused glass. Glass usually has melting points higher than metal, yet there are these new miniature kilns that work inside of a conventional microwave oven! 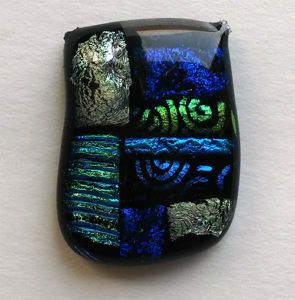 This makes fused glass work far more accessible and affordable from past days of using a larger plug-in electric kiln for hours. The time to melt an art glass cabochon was usually under five minutes with about 45 minutes needed for cooling. The larger kiln fit several pieces at once. The microwave being used for glass fusing needs to be dedicated to art use only and never used for food again. (Cadmium and other pigments used for colorants are toxic, so this is a needed safety precaution.) Care needs to be taken to not overheat the microwave and destroy it, so letting the door stand open and the unit cool off between rounds of fusing glass is needed. 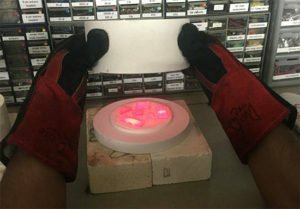 Also, microwave kiln shelf paper needs to be placed on the base of the kiln to keep glass from melting onto the surface the kiln and destroying it. Heavy weight welding gloves worked as oven mitts to transfer hot kilns and the kilns rested safely on our ceramic fire bricks to cool. Glass specifically made for fusing needs to be used for projects, like the brightly colored Dichroic glass example I made below. Dichroic and fusing glasses are the shiny, beautiful art glass pieces you always see in jewelry at art fairs. The price for making them yourself is very reasonable with this new method; you can buy enough to make several pieces for $20-$30. The kilns and tools to get started are being added to the small metals area and will be available within the following weeks.